Have you ever thought to yourself "Man, I really wish I could rub some Justin Timberlake all over my mouth right now?" Well, now's your chance! 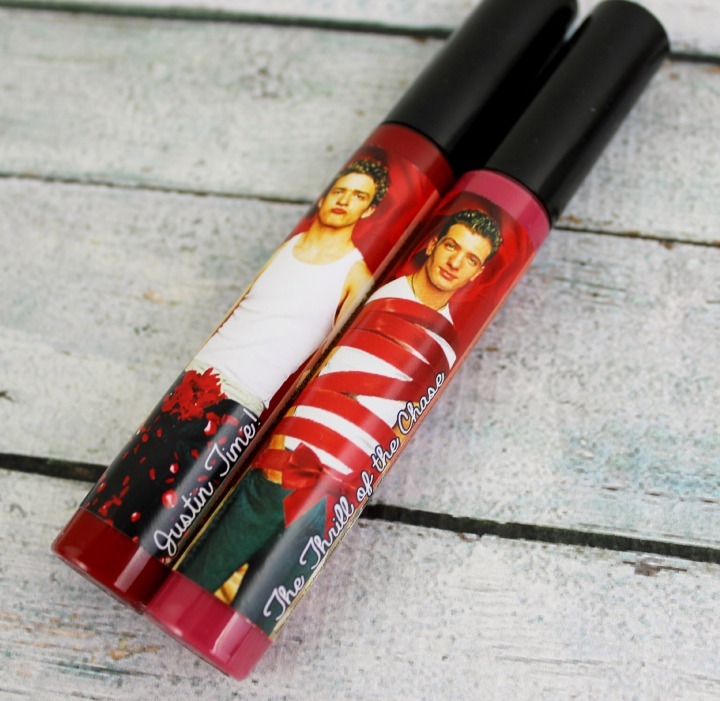 Today I'll be taking a look at Shiro Cosmetics' Battle of the Boy Bands: Tearin’ Up My Heart indie makeup collection, which unless I'm hallucinating, seems to be inspired by the members of NSYNC. You're welcome? 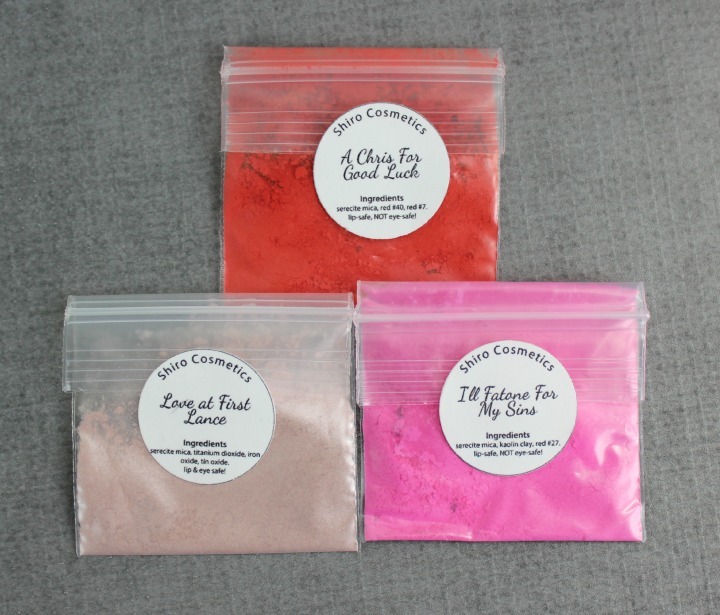 For those who are unfamiliar, Shiro is a handmade cosmetics company based in Portland. They specialize in fun and quirky eye, lip and face products, many of which are inspired by games, movies and other fandoms. They also distribute a couple of other indie brands—specifically Detrivore, Femme Fatale, and Victorian Disco. The collection I'm reviewing today is a Shiro original though! All of their cosmetics are vegan-friendly and cruelty-free. Both collections have five items: Two lip glosses and three face products. 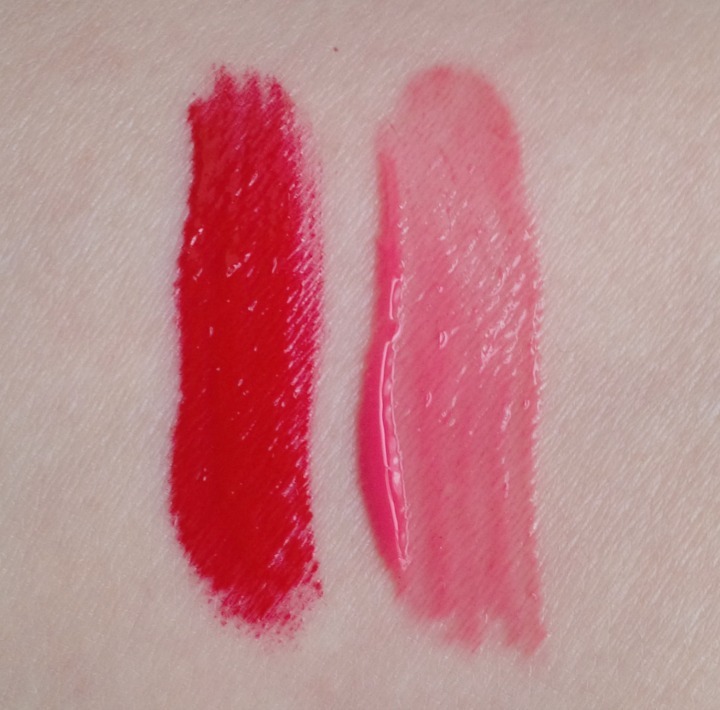 Justin Time: A creamy, intensely pigmented pinkish red. No sparkle here. Smells like vanilla. The Thrill of the Chasez: A moderately sheer bubblegum pink. Also not sparkly. Smells kind of like bubblegum unsurprisingly. Justin Time is intense. Like whoa. I would say it's almost more in liquid lipstick territory than traditional gloss—the shine isn't ultra long-lasting, but it definitely stains the lips a fair bit which means that hours can go by before it wears off completely. The texture is also totally delightful: Creamy, smooth, non-drying. I would buy this again 1000%. The Thrill of the Chasez is also nice, but definitely more subtle. In addition to being sheerer, it also disappears from my lips after an hour or two... as most lip glosses tend to. To be honest, I'm not crazy about the bubblegum scent—I think I'd prefer vanilla in both of them, but what can you do? Both of them do look pretty good though, I have to say. I purchased these in sample size, because I don't use blush half the time... is that weird? Who cares. 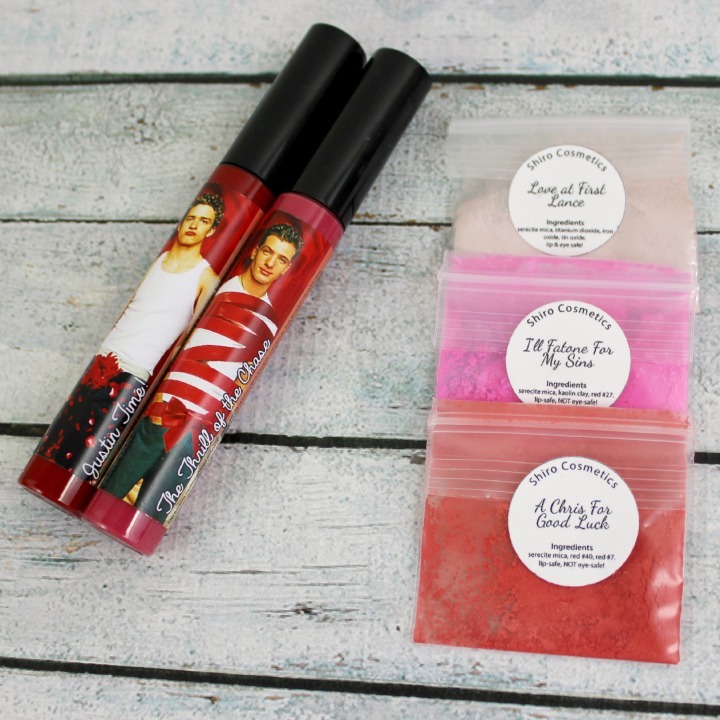 In any case, if you do purchase the full sizes then you'll get more lurid boy band label art like what's on the glosses—score! 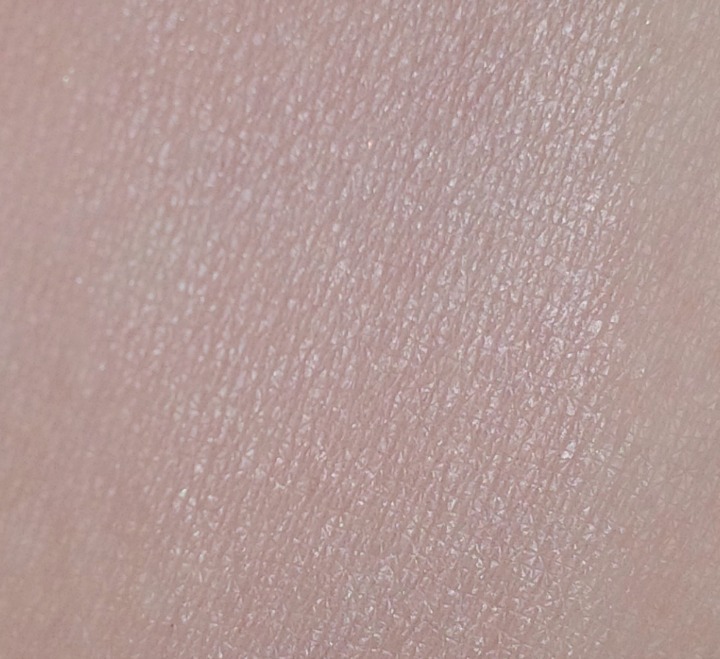 Love at First Lance: A cool-toned, very pale pink shimmery highlight shade. A Chris For Good Luck: A bright matte red blush. I'll Fatone For My Sins: Bright matte pink blush. Oooh, pretty. I like that this is shimmery without having full-on chunks of glitter in it—that makes it much more wearable, even on days when you're not staring at pictures of Lance Bass in the back of B.O.P. magazine. This would work well as a browbone/eye area highlight or as a general face illuminator, I think. A Chris For Good Luck is just too dark for me, I think. I like the idea of red blush, but when I actually put it on my face it looks like I just got a sunburn. Oh well. 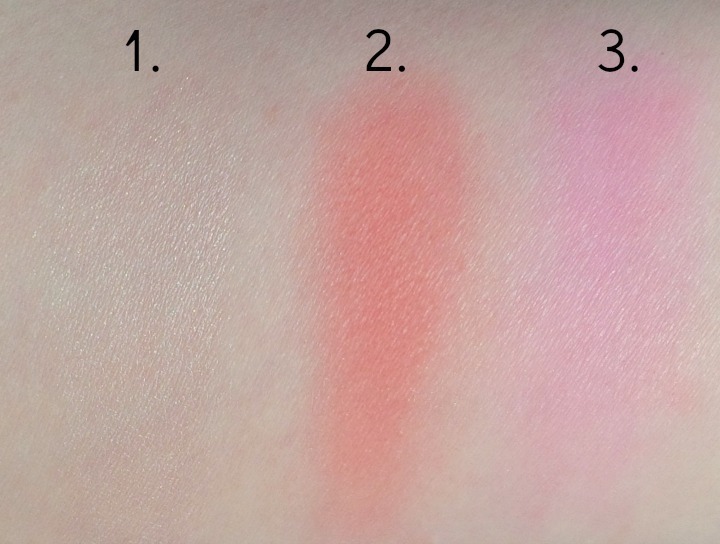 The good news is that the texture of the blush is lovely and fairly easy to blend. I'll Fatone For My Sins looks crazy bright in the jar, but it's totally wearable (and flattering) if you apply it with a light hand. That said, if you want intense hot pink cheeks, it's buildable too. I like this collection. If I were to purchase again knowing what I know now, I would definitely get the Justin Time gloss again, very likely get Love At First Lance, and maybe get I'll Fatone For My Sins. There's nothing really wrong with the other two, they just don't suit my personal preferences as well as the others. This was my first time trying any of Shiro's lip glosses, and I have to say, I was incredibly impressed with the texture. Indie lip products can be kind of hit or miss—sometimes they feel a bit grainy due to the nature of the ingredients being used, but that wasn't the case at all with these. They felt as smooth as NYX Butter Gloss (just to throw a specific example out there), but not as sticky. The blushes were also very nice, no clumps or random chunks of unblended pigment. Add that to the fact that Shiro shipped my order even quicker than the stated turnaround time, and you've got one very happy customer. PS This collection totes didn't tear up face. But it did tear up my heart. Just a little bit though. What do you think of the Shiro Tearin’ Up My Heart collection? NSYNC or Backstreet Boys 4 lyfe? The puns! xD and I might just drive myself crazy over "Love at First Lance" with that name and subtle angelic sheen. Totally wearable. Thanks for reviewing these! Oh the names are amazing! I'm sort of jealous of the Shiro team, I'm sure they had many, many laughs as they designed the label art and decided how to name this collection.